. . . to an introduction to New York Yearly Meeting (NYYM). 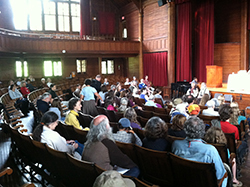 sessions—gatherings of Yearly Meeting members to conduct its business in worship. We invite you to join us by visitng one of our local meetings or one of our sessions, and to contact our office to learn more. New York Yearly Meeting . . .
We have meetings that have no pastors and worship in expectant, waiting silence, and we have meetings that do have pastors and have worship services with hymns, prayers, Bible readings, and sermons. Some meetings combine elements of both. Click the following to visit our NYYM Organization page. The Yearly Meeting organization includes a large number of committees organized into four sections: General Services, Ministry, Nurture, and Witness. It also includes a number of staff. The Yearly Meeting also has a conference center, Powell House, located in Old Chatham, New York, and a school, Oakwood Friends School, located in Poughkeepsie, New York. Some local meetings also have schools under their care. New York Yearly Meeting meets for a week in late July at Silver Bay YMCA resort camp on Lake George for its annual Summer Sessions to conduct the business of the Yearly Meeting. The body also gathers for a weekend twice a year in its Spring and Fall Sessions in rotating regions throughout the geographical area of the Yearly Meeting. The business meetings are held as meetings for worship with a concern for the life of the meeting. The sessions also include programs for the youth, open meetings for worship, sometimes programmed meetings for worship, prepared messages to the gathered body, committee meetings, and in the Summer Sessions, worship sharing groups and interest groups. And in all sessions, we enjoy fellowship—and fun.